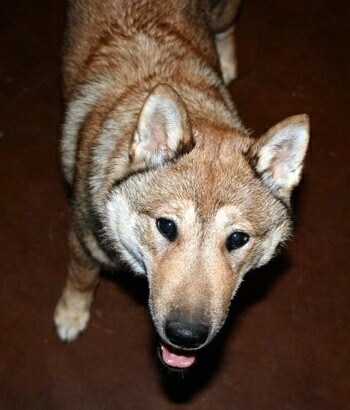 "Ahi is one of those dogs you only get to own once in your life; she is really special. She is tough as nails and full of personality. 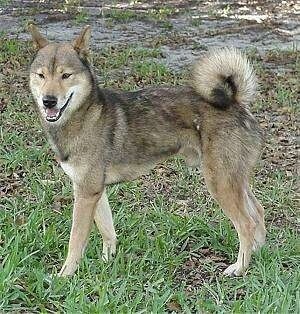 She exhibits all of the characteristics you would expect from a primitive breed like the Shikoku-Ken. She can show the most tenacious attitude and then turn around and be the sweetest pup you have ever met. She’s extremely loyal to us, but also loves most people, though she also possesses a “sixth sense” when it comes to trusting a person. Ahi is 1.5 years old in this picture." 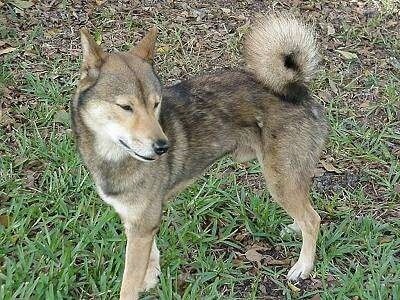 The Shikoku has a thick, double coat, erect ears, a curled tail, compact feet, and has sharper features than some other Japanese breeds. Like the Akita, the Shikoku has a scissor bite. Its eyes are dark brown, almond shaped and slanted. Coat colors are red, red-sesame, and blackish or black-sesame. The Shikoku is somewhat strongly tied to nature. It is cautious and brave; a temperate dog with good judgment. 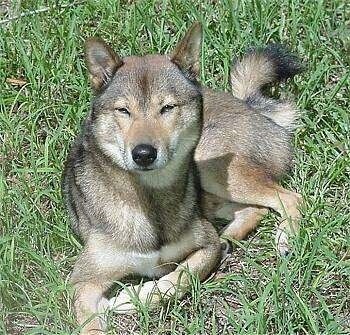 The Shikoku is also very loyal and submissive to its owner; it loves to be touched and often likes to give kisses. Although, it may be slightly aloof with strangers. This breed needs socialization early to avoid becoming aggressive toward other dogs. Dogs that do become dog aggressive need a competent owner/trainer who knows how to communicate to the dog that this is unacceptable behavior. Shikokus can get along with children if they are raised properly and vice-versa. They have a high prey drive and therefore may not be for everyone; should not be trusted with non-canine pets such as guinea pigs and hamsters. Since they are natural hunters, small animals in their yard may not exactly be safe. 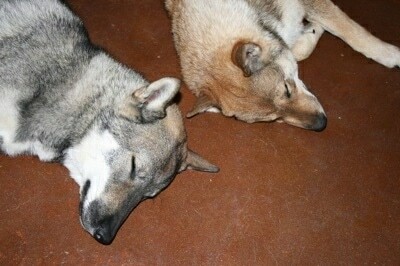 Shikokus are very intelligent and are fast learners. They need firm, confident and consistent leadership from the humans around them or they will become somewhat stubborn and quite relentless in attitude and play. 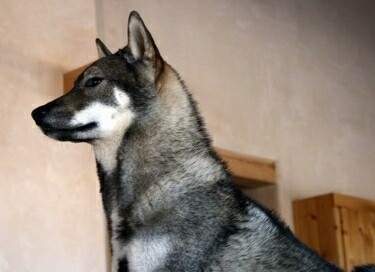 Although, they are said to be an easier dog to handle than their smaller Shiba and larger Akita cousins. Quick to learn, one owner reports, "They actually like to learn! My puppy knew to sit perfectly square at 9 weeks. He'll actually get excited when he sees me bring out the clicker." They are quick and agile and may do well in agility or obedience. 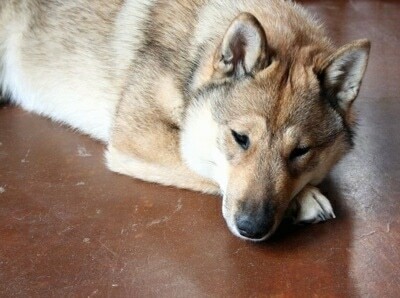 The alertness of a Shikoku may make it a good family watchdog. Shikoku pups can be quite vocal at times. They have a great sense of smell, which serves them well in tracking their quarry. 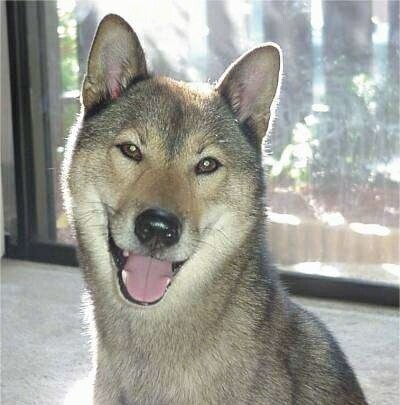 Quiet indoors, the Shikoku loves exercise outdoors and is very energetic. Socialize well when young; obedience training is recommended. They are quiet indoors, but love outdoor activities. They will not be happy away from their owners. 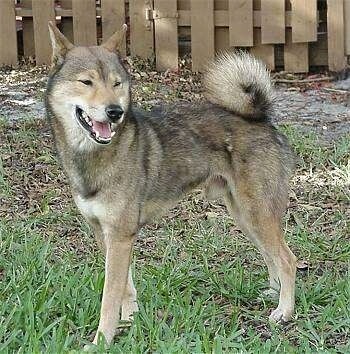 Shikokus should have a fenced yard, as they are hunting dogs with by nature with a very keen sense of smell and may take to roaming. 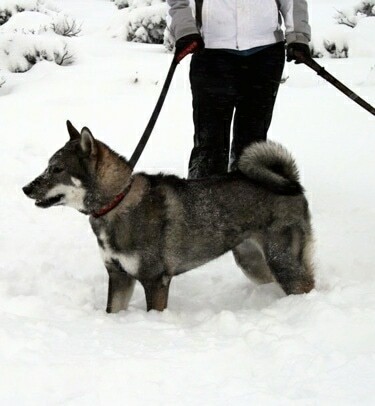 Shikokus do best with a good amount of exercise; they need to be taken on a daily walk or jog. 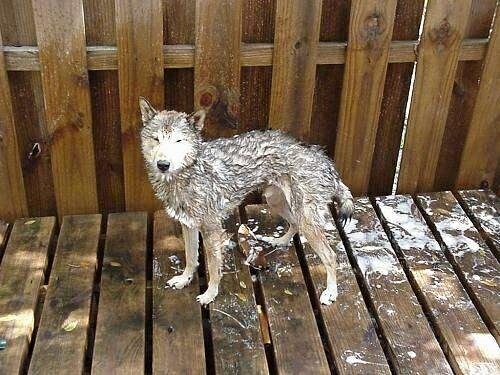 Do not let this dog roam free in an unsafe area. They have a high prey drive and may get themselves into trouble, i.e. hit by a car while chasing an animal. They are resilient and athletic dogs and show skills that may make them talented in agility or possibly obedience utility. They blow coat once or twice a year. A good undercoat rake makes grooming easy. Over-bathing may dry out their skin and therefore a bath every few months is usually sufficient. They do not have a strong doggy smell. 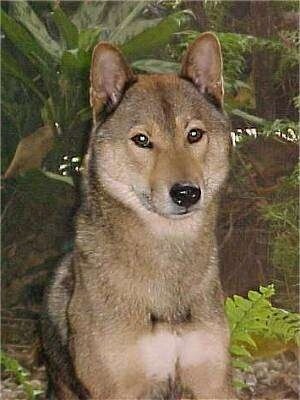 The Shikoku is also known as the Kochi-ken "ken" or "inu," which means dog in Japanese. 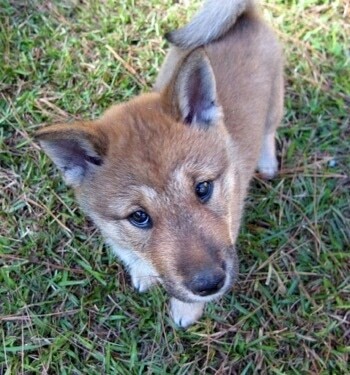 Kin to the smaller Shiba and larger Akita Inu, the Shikoku-Ken is a rare breed of dog, even in its native Japan. In 1937, the Shikoku was established as one of Japan’s national treasures. The Japanese bred the Shikoku to hunt deer and wild boar in the mountainous and fairly isolated Kochi prefecture located on the island of Shikoku. 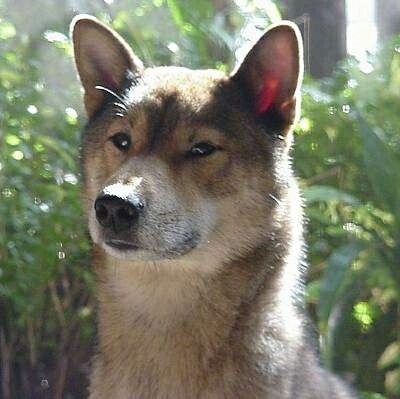 Shikokus are some of the purest dog breeds due to the remote nature of the region, which greatly restricted crossbreeding. "Loa is super sweet; all she wants to do is give kisses and play. She plays nonstop; she’s like the Energizer bunny! We call her “Loeybear” because she’s like a teddy bear, so soft and sweet. Loa rarely barks, in fact we have yet to hear her bark at all...she does chirp like a bird, though and sometimes will howl. She is very good with other dogs, which is not a common trait for Shikoku-Ken. She is weary of strangers, but once she warms up to you she gives lots of kisses. Lao is 8 months old in this picture." 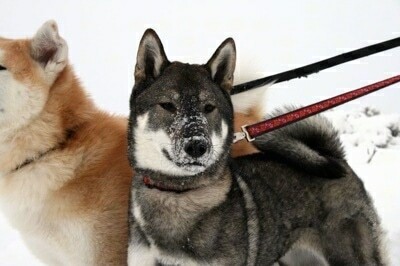 "Ronan (CKC Akashima's Kochi-Ken Choi Iki) is a red-sesame male Shikoku. He's true to his breed and is very energetic, loving and intelligent. He's 12 weeks old in this photo." Shin the Shikoku at bath time!